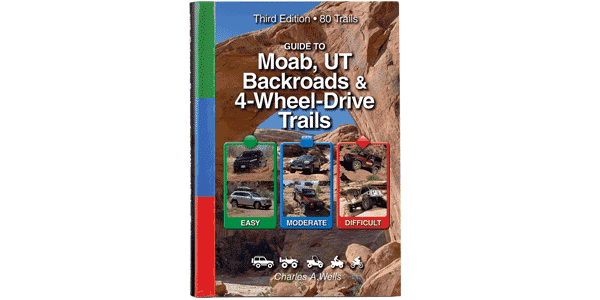 One of the most popular trails in Moab. If you fear rolling your vehicle, there are two obstacles, High Dive and White Knuckle, that you may wish to bypass. It’s a short detour to avoid High Dive, but if you take the bypass to White Knuckle, you’re really just taking an early exit route. That’s why, during a Jeep Safari, most people decide to go down White Knuckle, but with the help of a rear safety strap and lots of people to hold it. Also, extra rocks are usually stacked at the base of the obstacle, making it easier. ATVs and UTVs are legal on this trail, but operators will be tested. Helmets are definitely recommended. Very difficult. Many large ledges, both ascending and descending, that do not have bypasses. You’ll want front and rear lockers, body armor, 35-inch tires and some gutsy driving skills.